Leave a message in the PIRATES LOG! Abeam: at right angles to the centerline of and outside a ship. Accommodation ladder: a portable flight of steps down a ship's side. Adrift: loose from moorings, or out of place. All hands: entire ship's company, both officers and enlisted personnel. Amidships (or midships): in middle portion of ship, along the line of the keel. Anchor detail: group of ship's personnel who handle ground tackle when the ship is anchoring or getting under way. Athwart, athwartships: at right angles to the fore and aft or centerline of a ship. Bail: to dip water out of a boat with a bucket. A hoop or ring; a half hoop or yoke. Belay: to cancel an order; to stop; to firmly secure a line. Bight: middle part of a line as distinguished from the end and the standing part; a single complete turn of line; bend in a river or coastline. Billet: a crew member's assigned duties within the ship's organization. Bitt: strong iron post on ship's deck for working or fastening lines; almost invariably in pairs. Bitter end: the utmost end of a line. Boat fall: rigging used to hoist or lower ship's boats. Boat gripe: lashing used at sea to secure a boat hanging from the davits against the strongback and away from the ship's side. Boat painter: rope attached to the stern ringbolt of a boat; used for securing it. Also a short piece of rope secured to the bow of a boat; used for towing or making fast. Not to be confused with the sea painter, which is a much longer rope. Boatswain: warrant officer in charge of deck work. Pronounced "bosun". Boatswain's pipe: small, shrill silver whistle used by boatswain's mate to pass a call or pipe the side. Bollard: wooden or iron post on a pier or wharf to which mooring lines are secured. Bow: forward section of a vessel. Break out: to unstow or prepare for use. Bridge: raised platform from which ship is steered, navigated, and conned; usually located in forward part of the ship. Bridle: span of rope or chain with both ends secured. Broad on the starboard or port beam: bearing 090 degrees or 270 degrees relative to the bow of the ship. Broad on the starboard or port quarter: bearing 135 degrees or 225 degrees relative to the bow of the ship. Brow: large gangplank leading from a ship to a pier, wharf, or float; usually equipped with rollers on the bottom and hand rails on the side. Bulkhead: one of the vertical wall-like structures enclosing a compartment. Bull nose: a closed chock at the head of the bow on the forecastle deck. Bulwark: raised plating or woodwork running along the side of a vessel above the weather deck. Helps keep decks dry and prevents crew and gear from being swept overboard. Camel: large fender float used for keeping vessel off wharf, pier, or quay; usually of one or more logs. Cargo whip: rope or chain used with a boom for handling cargo. One end has a heavy hook; the other end is rove through a block and taken to the winch. Also, called cargo hoist or cargo rope. Carry away: to break loose, tear loose, or wash overboard. Cast off: to throw off; to let go; to unfurl. Chains: platform or a general area on either side of forward part of a ship where leadsman stands as he or she takes soundings. Check: to slack off slowly; to stop a vessel's way gradually by a line fastened to some fixed object or to an anchor on the bottom; to ease off a rope a little, especially with a view to reducing the tension; to stop or regulate the motion, as a cable when it is running too fast. Chock: steel deck member, either oval or U-shaped, through which mooring lines are passed. Usually paired off with bitts. Clamp down: going over a deck with damp swabs; a lesser form of swabbing down. Cleat: (1) a small, metal deck fitting with horns; used for securing lines; also called belaying cleat. (2) Short piece of wood nailed to brow of gangplank to give surer footing. Colors: national ensign; distinguishing flag flown by a vessel to indicate her nationality. Also, the ceremonies performed at a naval activity when colors are hoisted at eight o'clock and hauled down at sunset. Companionway: set of steps or ladders leading from one deck level to another. Coxswain: enlisted man in charge of a boat; acts as helmsman. Pronounced "koksun." Cradle: a stowage rest for ship's boat. Davit: shipboard crane that can be swung out over the side; used for hoisting and lowering boats and weights. Often found in pairs. Dead reckoning: navigator's estimate of ship's position from the course steered and the distance run. Deck: on a ship corresponds to the floor of a building on land. Deep: the distance in fathoms between two successive marks on a lead line, as "By the deep, four." Deep six: slang meaning to dispose of by throwing over the side. Also, when referring to lead line use, a depth of six fathoms of water. Dip: lowering a flag part way in salute or in answer, and hoisting it again. A flag is "at the dip" when it is flown at about two-thirds the height of the halyards. Dog: metal fitting used to secure watertight doors, hatch covers, scuttles, etc. Dogwatch: one of the two-hour watches between 1600 to 2000. Dolphin: cluster of piles for mooring. Double up: to increase the number of ship-to-pier turns of a mooring line. Ease off: to ease a line; slacken it when taut. Fairlead: an eye, block, or fitting furnishing a clear lead for a line. Fairway: in inland waters, an open channel or midchannel. Fake down: coiling down a line so that each fake of rope overlaps the one underneath and makes the line clear for running. Fancy work: intricate, symmetrical rope work used for decorative purposes. Fantail: main deck section in the after part of a flush-deck ship. Fast: snugly secured; said of a line when it is fastened securely. Forecastle: upper deck in forward part of the ship. Pronounced "foke'-sul"; abbreviated fo'csle. Frap: to bind lightly by passing lines around; to draw together the parts of tackle or other combinations of ropes to increase tension. Gangway: opening in the bulwarks of the rail of the ship to give entrance at the head of the gangplank or brow; an order to stand aside and get out of the way. General quarters: battle stations for all hands. 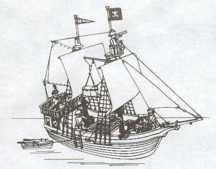 Gripes: metal fastenings for securing a boat in its cradle; canvas bands fitted with thimbles in their ends and passed from the davit heads over and under the boat for securing for sea. Handsomely: to ease a line gradually; to execute something deliberately and carefully, but not necessarily slowly. Head: compartment of a ship having toilet facilities. Heave 'round: to revolve the drum of a winch or windlass so as to pull in a line or anchor cable. Heave to: to bring the ship's head into the wind or sea and hold her there by the use of engines and rudder. Holiday: an imperfection or vacant space in an orderly arrangement; spots in painted work left unfinished. Hull down: said of a distant vessel when only her stack-tops and mast are visible above the horizon. Jack: flag similar to the union of the national ensign; flown at the jackstaff when in port; plug for connecting an electrical appliance to a power or phone line. Jacob's ladder: light ladder made of rope or chain with metal or wooden rungs; used over the side and aloft. Jury rig: makeshift rig of mast and sail or of other gear, as jury anchor, jury rudder; any makeshift device. Knife edge: smooth, polished edge of the coaming against which the rubber gaskets of watertight doors and scuttles press when closed; furnishes better watertight integrity. Knock off: to cease what is being done; to stop work. Ladder: in a ship, corresponds to stairs in a building. Lee: direction away from the wind. Liberty: any authorized absence granted for short periods to provide respite from the work environment or for other specific reasons. Liberty is not chargeable to the member. Locker: small metal or wooden stowage space; either a chest or closet. Lucky bag: locker for stowage of personal gear found adrift. Mark: fathoms in a lead line that are marked. Marry: placing two lines together, as in hoisting a boat; to sew together temporarily the ends of two lines for rendering through the block. Mess: to eat; group of crew members eating together; the compartment or location for the dining of a select group aboard ship, such as the CPO mess. Messenger: light line used for hauling over a heavier rope or cable; for example, the messenger is sent over from the ship to the pier by the heaving line and then used to pull the heavy mooring lines across. Also, an enlisted crew member who runs errands for the OOD. Monkey fist: a knot, with or without a weight enclosed, worked in the end of a heaving line to form a heavy ball to facilitate throwing the line. Mousing: small stuff seized across a hook to prevent unhooking. Oscar: Traditionally, the name given to the dummy employed for ship's "Man overboard" drills; the flag hoisted by a ship to indicate a man/woman overboard. Overhead: on a ship, equivalent to the ceiling of a building ashore; ships have overheads rather than ceilings. Pad eye: metal eye permanently secured to deck or bulkhead. Painter: a line in the bow of a boat for towing or making fast. Pass the word: to repeat an order or information to all hands. Pelican hook: hinged hook held in place by a ring; when the ring is knocked off, the hook swings open. Pelorus: navigational instrument used in taking bearings; consists of two sight vanes mounted on a hoop revolving about a dumb compass or a gyro repeater. Pollywog: person who has never crossed the line (equator). Port: left side of the ship facing forward; a harbor; an opening in the ship's side. The usual opening in the ship's side for light and air is also a port. The glass set in a brass frame that fits against it is called a port light. Quarter: that part of ship's side near the stern. Quarterdeck: that part of the main (or other) deck reserved for honors and ceremonies and as the station of the OOD in port. Quarters: living space; assembly of the crew; all hands assembled at established stations for muster, drills, or inspections. Rate: grade of official standing of enlisted personnel. A rate identifies an enlisted member by pay grade or level of advancement with a rating; a rate reflects level of aptitude, training, experience, knowledge, skill, and responsibility. Rating: name given to an enlisted occupational specialty that requires basically related aptitudes, training, experience, knowledge, and skills. Reeve: to pass the end of a rope through any lead, such as a sheave or fairlead. Relative bearing: bearing or direction of an object in degrees in relation to the bow of the ship. The bow of the ship is taken as 000 degrees and an imaginary circle is drawn clockwise around the ship; objects are then reported as being along a line of bearing through any degree division of this circle. Relieving (the watch, the duty, etc. ): to take over the duty responsibilities, as when one sentry relieves another. Those who relieve are reliefs. Scupper: opening in the side of a ship to carry off water. Scuttle: small opening through hatch, deck, or bulkhead to provide access; similar hole in side or bottom of ship; cover for such an opening; to sink a ship intentionally by boring holes in the bottom or by opening seacocks. Scuttlebutt: drinking fountain. Also, a rumor, usually of local importance. Sea lawyer: enlisted member who likes to argue; usually one who thinks the regulations and standing orders can be twisted to favor his or her personal inclinations. Secure: to make fast; to tie; an order given on completion of a drill, exercise or evolution, meaning to withdraw from the corresponding stations and duties. Secure for sea: extra prescribed lashings on all movable objects. Shellback: person who has crossed the equator and been initiated. Shore up: to prop up. Shot: short length of chain, usually 15 fathoms. Side boys: non-rated personnel manning the side when visiting senior officers or distinguished visitors come aboard. Single up: to reduce the number of mooring lines out to a pier preparatory to sailing; that is, to leave only one easily cast off line in each place where mooring lines were doubled up for greater security. Sound: to measure depth of water by means of a lead line. Also, to measure depth of liquids in oil tanks, voids, blisters, and other compartments or tanks. Spanner: a tool for coupling hoses. Spring: mooring line leading at an angle of about 45 degrees off centerline of vessel; to turn a vessel with a line. Square away: to get things settled down or in order. Starboard: right side of a ship looking forward. Steady: order to helmsman to hold ship on course. Steerageway: slowest speed at which a ship can be steered. Stem: upright post or bar at most forward part of the bow of a ship or boat. It may be a casting, forging, welding, or made of wood. Stern: after part of a ship. Stopper: short length of rope or chain firmly secured at one end; used in securing or checking a running line. Stow: to put gear in its proper place. Striker: enlisted member in training for a particular rating. Swab: a rope or yarn mop. Tackle: arrangement of ropes and blocks to give mechanical advantage; a purchase, that is, a rig of lines and pulleys to increase available hauling force. Pronounced "take-el". Taffrail: a rail at the stern of a ship. Take a turn: to pass a turn around a cleat, bitts, or bollard with a line and hold on. Toggle: wooden or metal pin slipped into a becket; furnishes a rapid release. Topping lift: line used for topping a boom and taking its weight. Trice up: to hitch up or hook up, such as trice up a rack. Turn to: an order to begin work. Two-blocked: when two blocks of a tackle have been drawn as closely together as possible. Veer: to let anchor cable, line, or chain run out by its own weight. Also, when the wind changes direction clockwise or to the right, it is said to veer. Very well: reply of a senior (or officer) to a junior (or enlisted person) to indicate that information given is understood, or that permission is granted. Void: empty compartment below decks. Wardroom: officer's mess and lounge abroad a ship. Watchcap: knitted wool cap worn in cool or cold weather; canvas cover placed over a stack when not in use. Weather deck: portion of main, forecastle, poop, and upper deck exposed to weather. Whipping: keeping the ends of a rope from unlaying, by wrapping with turns of twine and tucking the ends.